We frequent the Hillcrest Farmers Market quite a lot. While I try to venture around San Diego and check what other farmers markets have to offer, what always brings me back to the Hillcrest one are the scotch eggs sold at Bubbles Gourmet Foods. I’ve written about Bubbles before and since we initially spotted his scotch eggs in 2006, the price on these little meaty gems have gone up significantly from $3 to a whopping $3.75. Okay, so it’s not much of a price jump but when you can get bite-sized coconut pancakes for $.25 each a few stalls down the way, every quarter helps. Anyways, I’ve been meaning to try making scotch eggs myself. And once I made them, I don’t think I’ll be going to Bubbles any time soon for them. They are easy! I took several shortcuts when doing the scotch egg: baking instead of deep frying and using pre-made low-fat breakfast sausage meat. Once the eggs were boiled, assembling and cooking the things took less than 40 minutes. 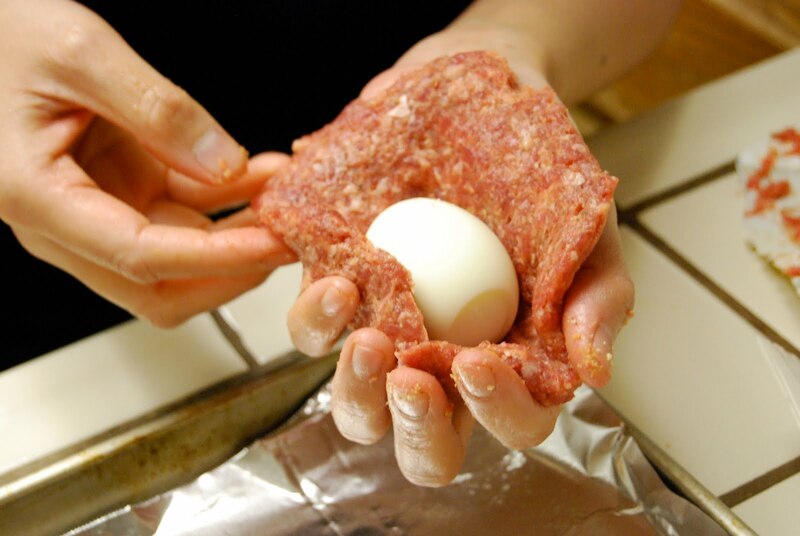 A tube of breakfast sausage makes approximately 3-4 scotch eggs, depending on how thickly covered you want each egg to be. I say go thicker since the eggs tend to break through the sausage covering and gets scorched during the cooking process. 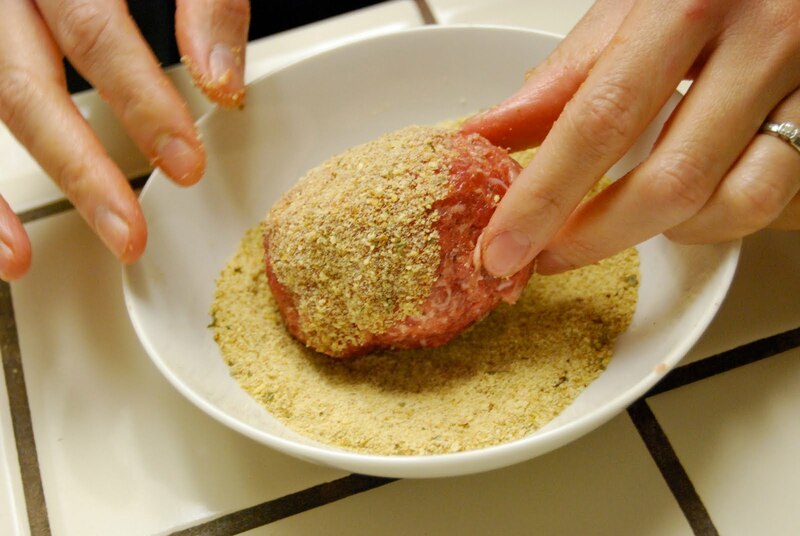 After the egg is wrapped in sausage, give it a quick roll in breadcrumbs and pop ’em into the oven at 400° F for about 30-35 minutes. Turn them over halfway through the bake time. That’s it. I’ve seen it served alongside hot mustard but my favorite condiment is HP Sauce. So simple and fast and most importantly, so deliciously meaty! I’m not even surprised the scotch egg has its own informative and annoyingly-catchy, theme song. Ha ha! I cant listen to the song but it sounds funny. Didnt you know everything british is extremely expensive?! That does sound expensive, they are staple items in the supermarket next to the sandwiches at home and I'm sure they arent $4 each. I used to quite like them when I ate meat, it was a toss up between that and a pork pie, as long as the pork pie didnt have too much nasty jelly in. Ick. Well, now I'm going to have to make scotch eggs. We haven't gotten any at the Poway farmers market, but I have purchased the coconut pancakes (which were 5 for $1).Where do you buy HP sauce? I've been wanting to make some of these, and now you saying they are easy makes me want to make them even more! Jennywenny–I have yet to try pork pie. It didn't realize they were staple items. I think this calls that I need to make a return trip to Britain soon.Leanne–I've seen HP Sauce in Ralph's of all places. 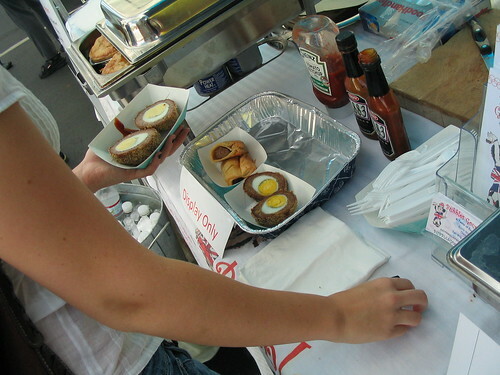 I think I need to make a trip out to the Poway farmers market soon.Dan–They are so easy to make, it's ruined me from buying them again.Diligent Diletante–I love scotch eggs upon my first tasting in London but they are awfully rich. Looking forward to seeing what you think about them. Hey Darlene! I've been curious about those eggs for a while now… I think I'll splurge on them (monetarily and calorically) the next time I'm at the farmers' market. Moowiesqrd–The scotch eggs are expensive both in calories and the budget. When I do splurge, I only eat half an egg. But now that I can make it at home, I really have to watch out. I'd be interested in what you think about them.